The design world has long held a special place for rustic decor, and for good reason. Unpretentious and timelessly appealing, the rustic sensibility draws from antiquated eras to blend old world elegance with modern subtlety. Unfinished wood, repurposed household goods, and an overall organic attitude all reflect the quintessential rustic style, with no shortage of clever DIY implements. 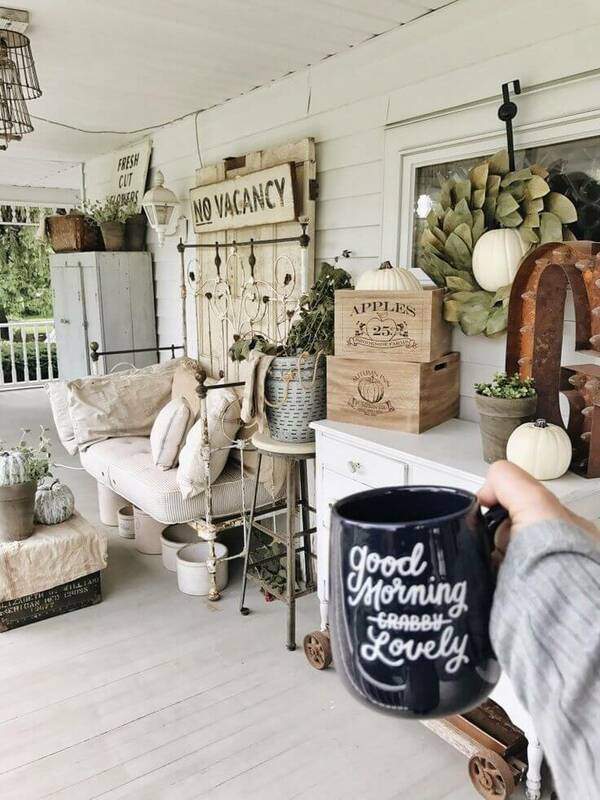 This season the classic farmhouse sits front and center for outdoor inspiration, and where better than the front porch to show off some rustic charm? 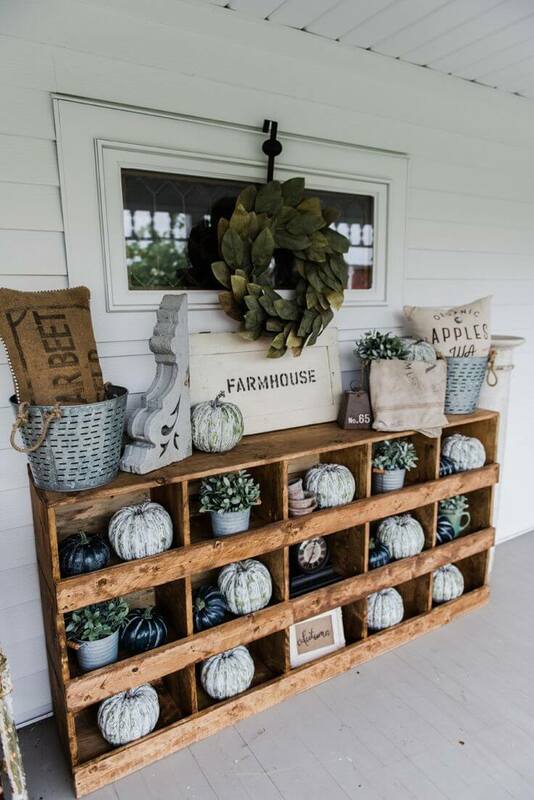 From planters to rockers to warm welcoming signs, these 47 rustic farmhouse porch decor ideas are sure to delight both guests and residents year-round. Guests can’t doubt their welcome when it’s written large as life. 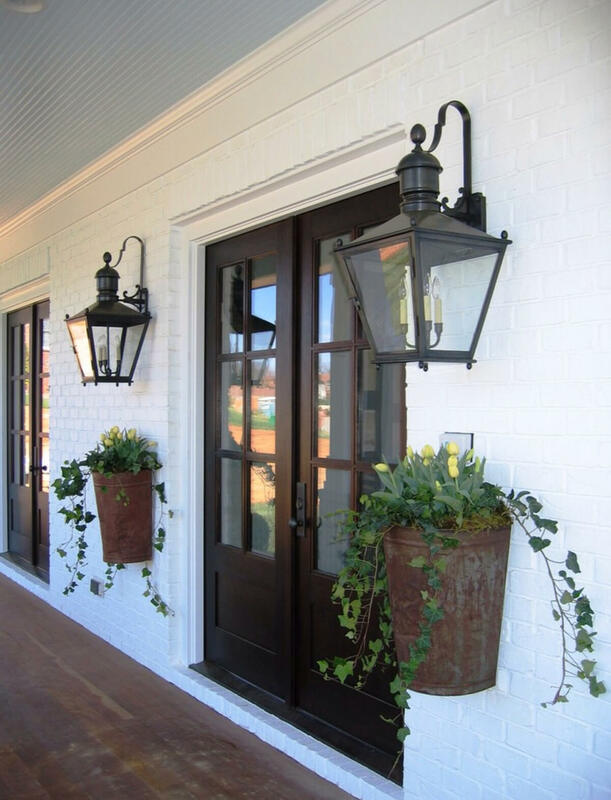 The natural elegance of a single potted fern, with the warm light of single candle at its foot, make this porch’s welcome irresistible. Nothing goes to waste on a true homestead, and that spirit is evident in this trash-to-treasures display. The broken ladder and washboard-texture wall provide just the right backdrop for colorful flowers and a collection of found objects. The porch’s handsome barnwood floor and white walls come together with an upcycled painted wooden cable spool. 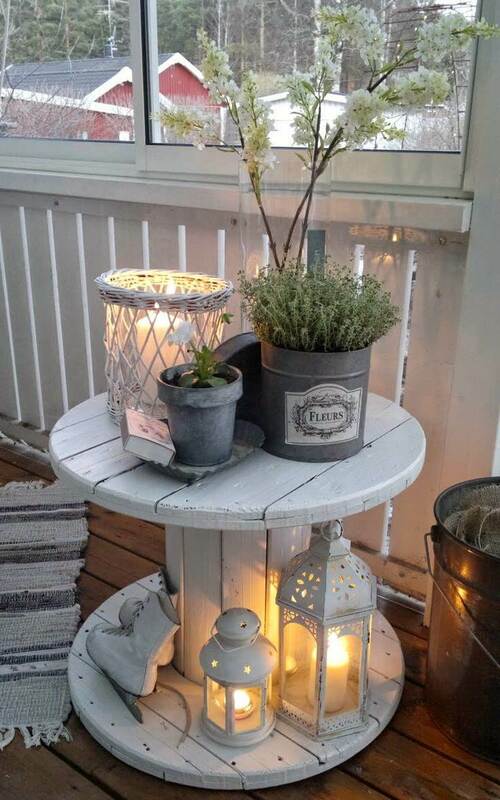 The fun collection of lamps and lanterns makes it a focal point, or, an elegant alternative to an outdoor campfire at night. 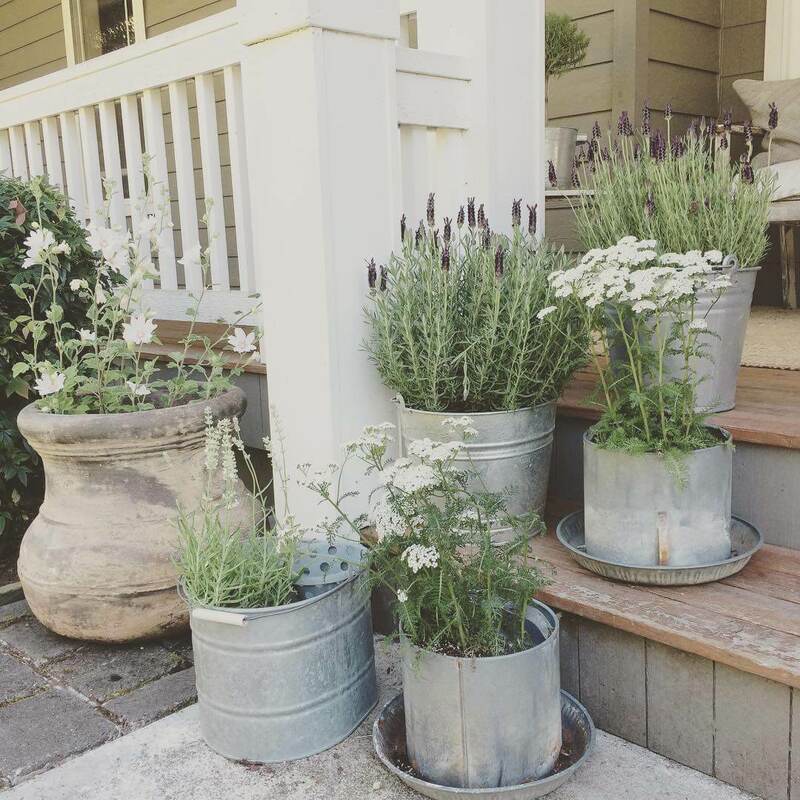 Potted herbs are given down-to-earth charm and a unified palette with a collection of repurposed metal buckets and pie plates. Grouping them on the steps softens sharp corners, and offers a fragrant welcome. Monograms lose their stuffiness when carved in wood and painted in rich country colors. 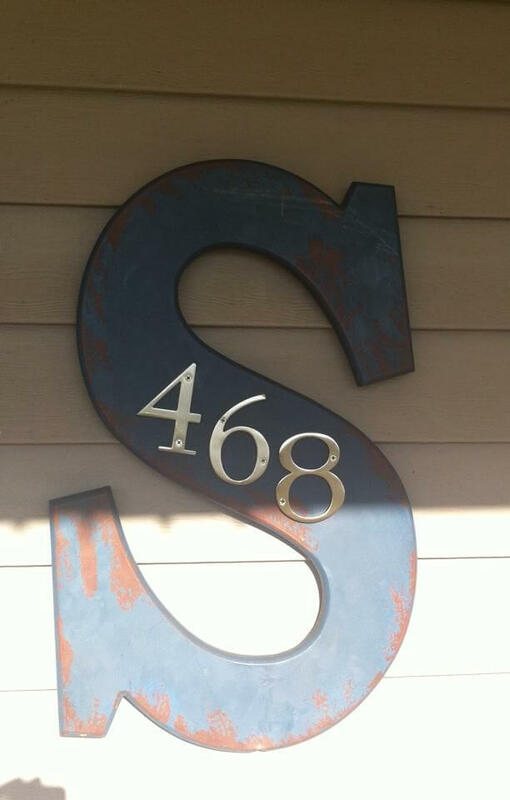 Bold, large and mounted by the front door, this one serves as an attractive and personalized frame for house numbers. 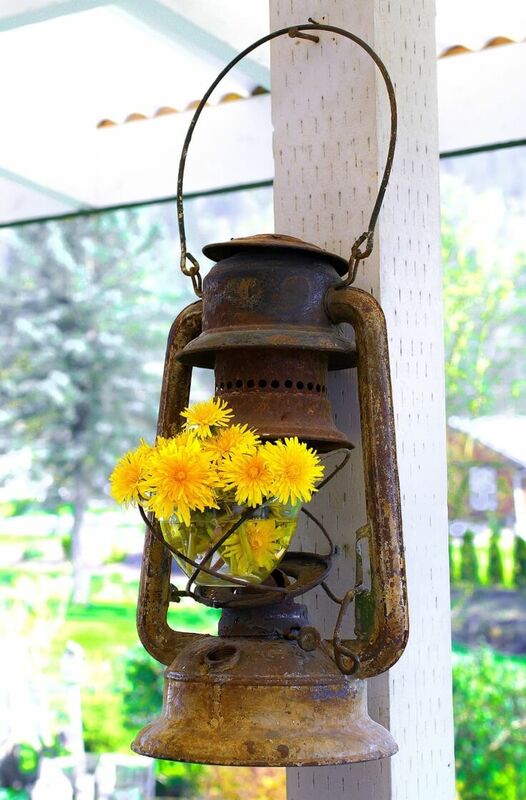 Kerosene lanterns and hurricane lamps may have given way to solar uplights and strings of electric bulbs, but they can still brighten a porch when showing off a hand-picked selection of sunny dandelions or wildflowers. A celebration of springtime color wouldn’t be complete without real flowers. 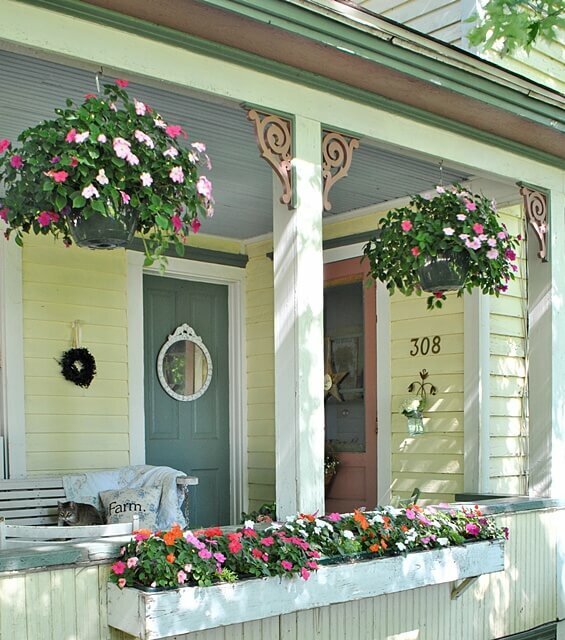 Windowboxes, hanging baskets, pots and borders all make this porch a vibrant and fragrant warm-weather oasis. 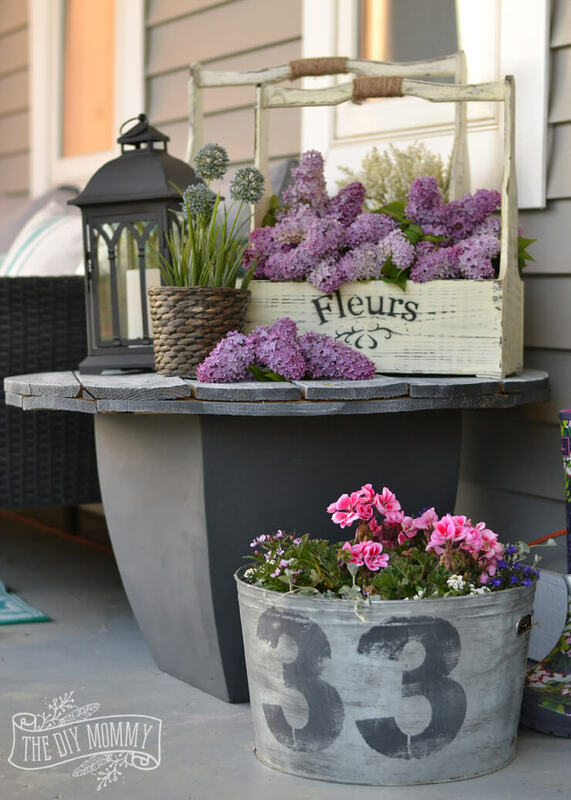 A utility cart showcases a tiny garden of colorful blooms and potted succulents, filling an empty corner with natural beauty. When entertaining, its versatility is a key feature, whether it’s rolled aside to make room, or cleared for refreshments. 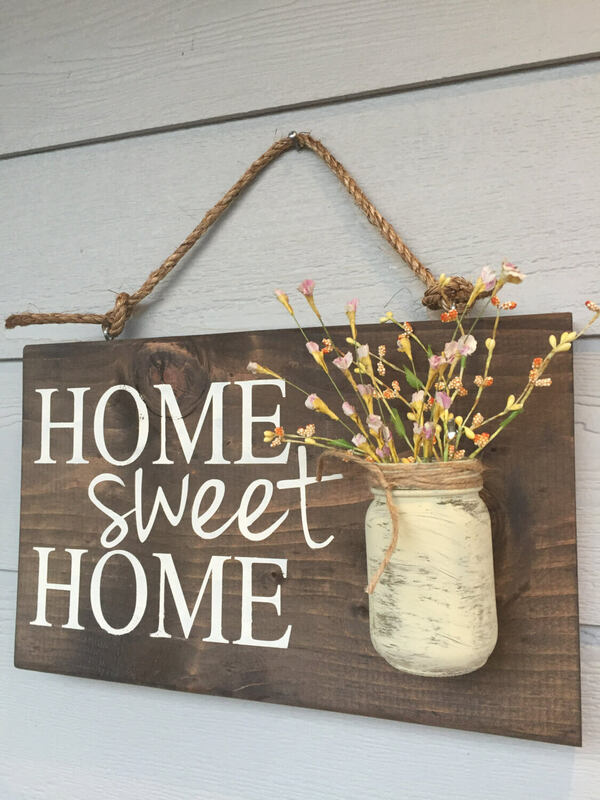 Home Sweet Home says it all, a sentiment made new each day with a fresh collection of selected garden flowers in the painted mason jar. The dark stained knotty board and rough rope supply the perfect rustic touch. 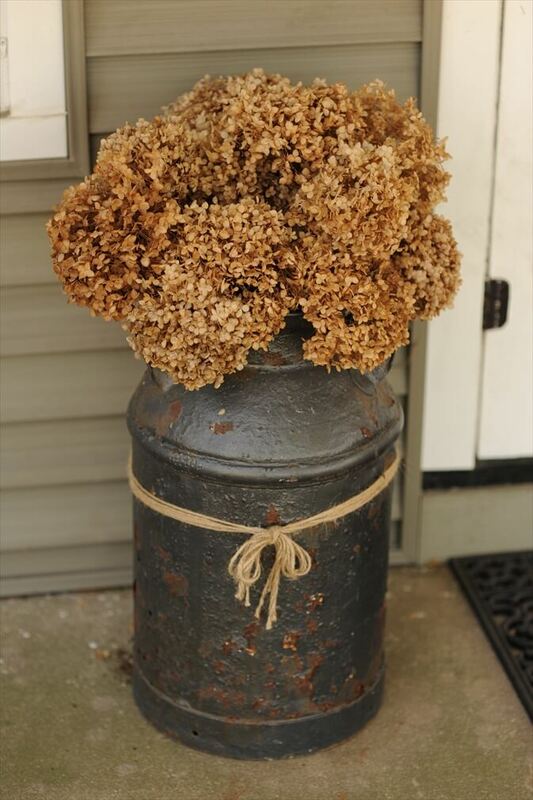 Metallics and neutrals, combined with natural textures like these dried hydrangea blossoms in their oversized iron gray jar with a twine bow accent, lend an understated elegance to an autumn porch. A personalized mural is the perfect focal point for letting family and friends know what it’s all about. The monochromatic palette helps the space feel clean and breezy. Textures ranging from glass and rough wood to soft fabric all come together beautifully in clean bright white, providing a perfect backdrop for a statement sign and welcoming carriage lantern. 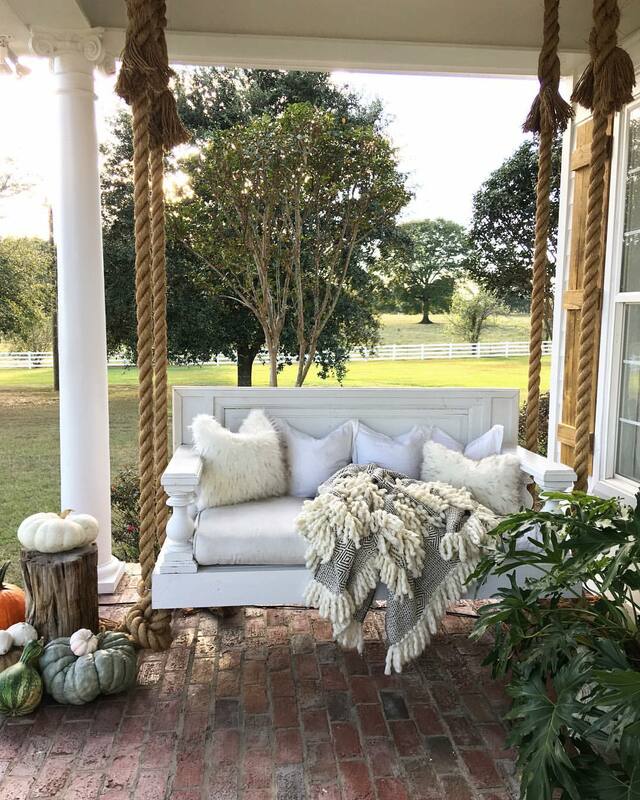 Piles of pillows and heavy nautical rope add interest and an inviting softness to this painted porch swing. 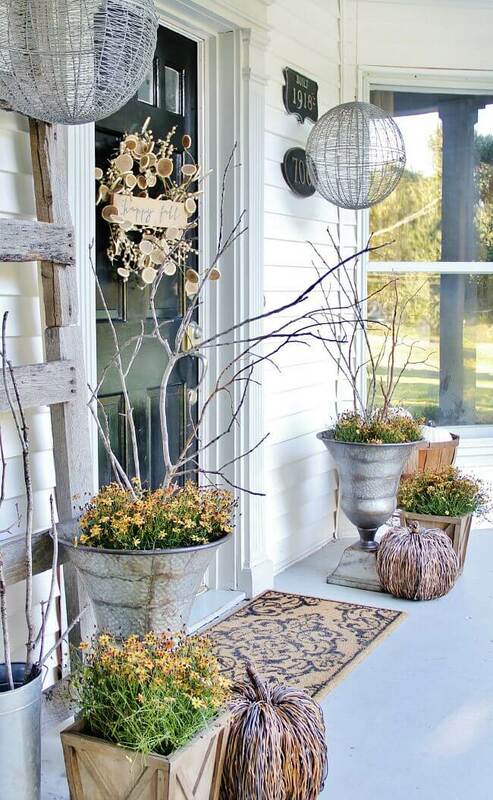 A collection of unusual gourds grouped around a worn stump completes the look of country comfort. 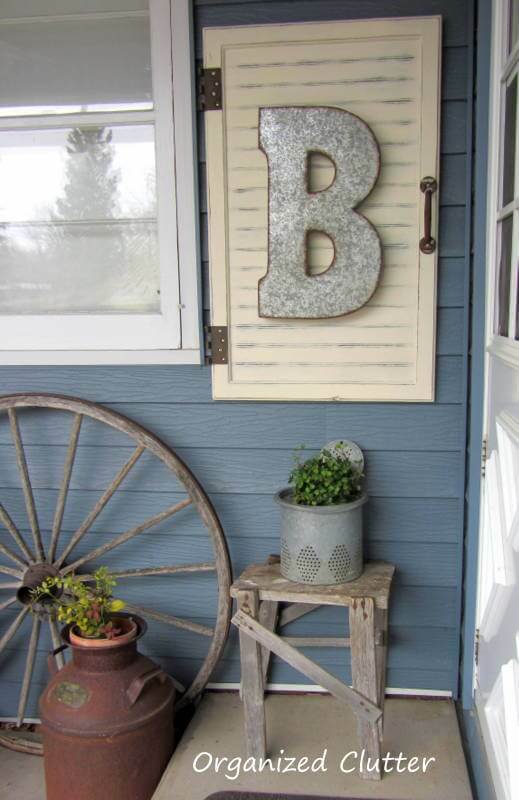 A wagon wheel, milk churn, scrapwood table, colander flowerpot and distressed cabinet door come together in an inviting still life when grouped artistically together at the doorstep, stamped with the family’s monogram. A wooden fruit tray, mounted sideways on the wall, serves as both shelf and rustic frame for the best and boldest blooms from a summer garden, here arranged in an antique metal pitcher. 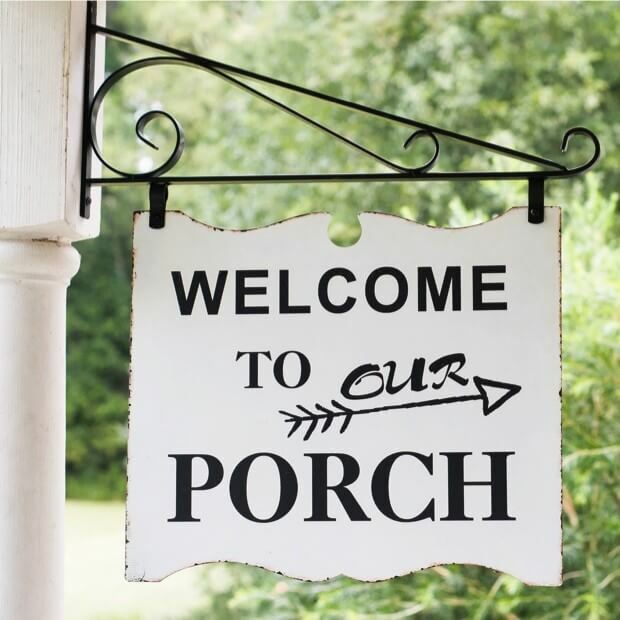 A hand painted wooden sign hung from a black metal bracket welcomes visitors to the family porch. 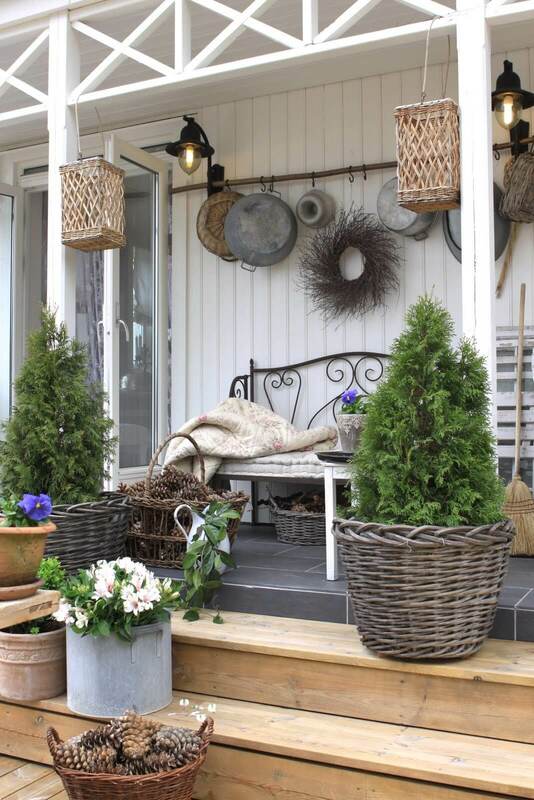 Such creative personal touches make outdoor living rooms extra inviting for neighbors and friends. 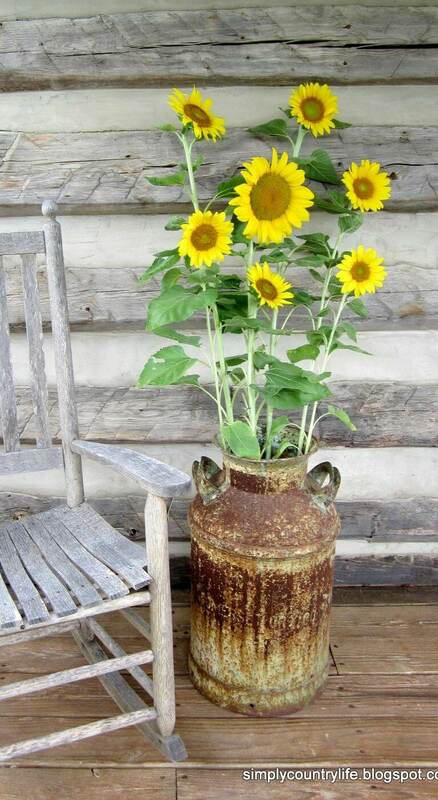 A rusty milk churn’s bold color and solid shape serve as a perfect foil for exuberant sunflowers as they brighten a gray log wall, and invite guests to settle in the nearby rocking chair. 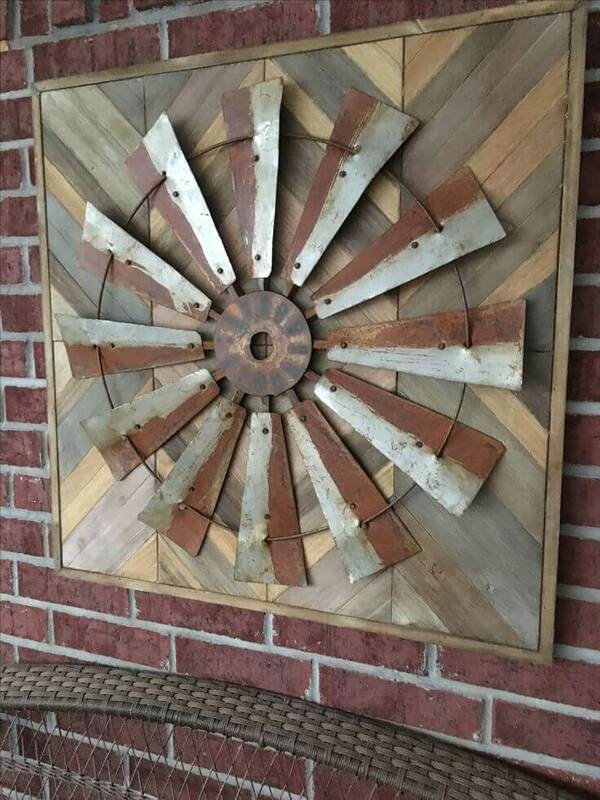 An old windmill’s metal blades find new life against herringbone boards and a brick wall. The layers of textured rectangles makes a marvelous focal point, and puts a new spin on popular sunburst wall decorations. The comfortable clutter surrounding a daybed and its neighboring storage cupboards all comes charmingly together under a united palette of neutrals and creams: a perfect bright spot to start the day. 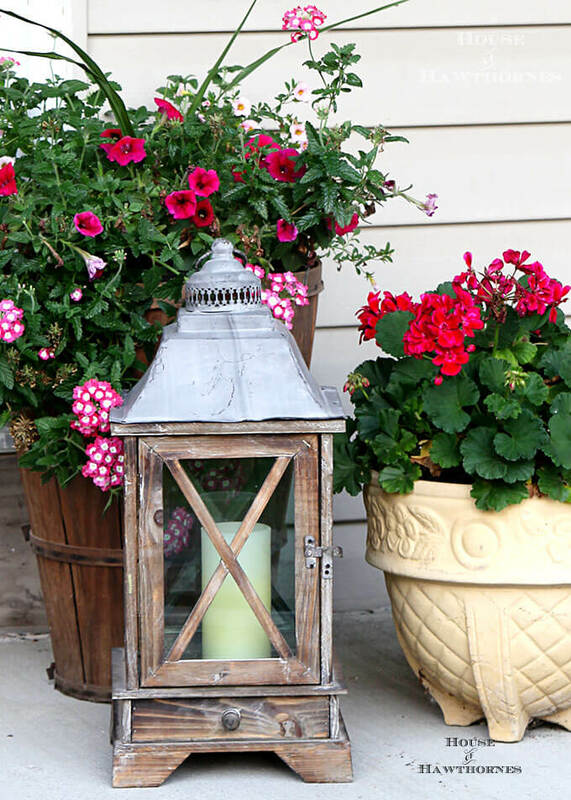 Potted flowers frame an antique lantern with pops of color. A citronella candle inside can ward off unwelcome biting insects when evening falls, and illuminate the space without harsh electric lighting. Piles of soft lilac blooms fill a side table with color and fragrance. On the floor nearby, the flower-filled washtub offers an inexpensive and creative way to display house numbers. 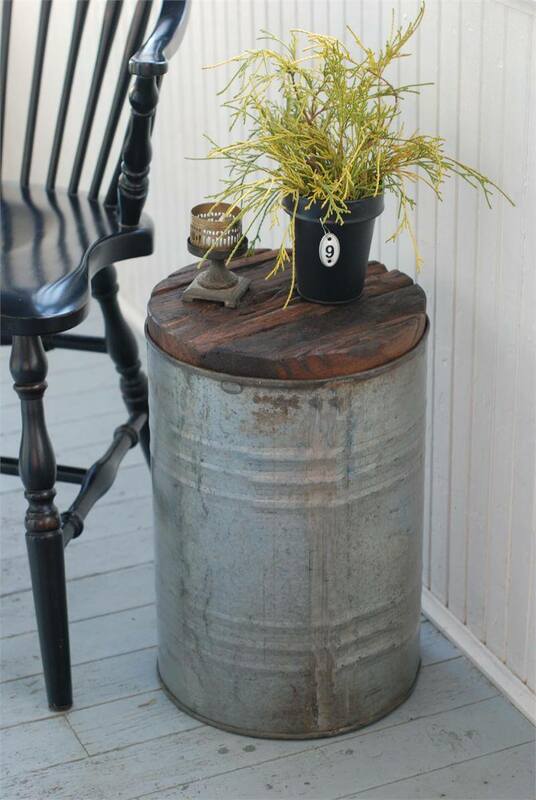 Pots, pans, wooden boxes or rusty buckets: found objects that can hold plants and flowers are irresistible when they carry their own rustic character and charm, especially when lit from above by vintage-styled carriage lanterns. 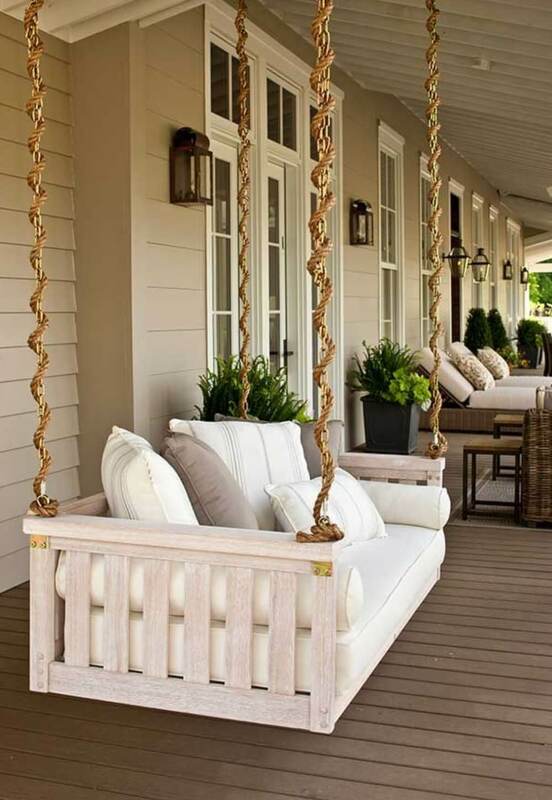 Rope twisted around the supporting chains of a porch swing add a decorative touch, and protect fingers from being pinched. Clean open floors and soft neutrals make this extra long porch extra inviting. Plentiful gourds and potted plants fill cabinet shelves, turning a long narrow window into a show-stopping focal point that recalls the friendly welcome of farmers markets, or yesterday’s five and dime. 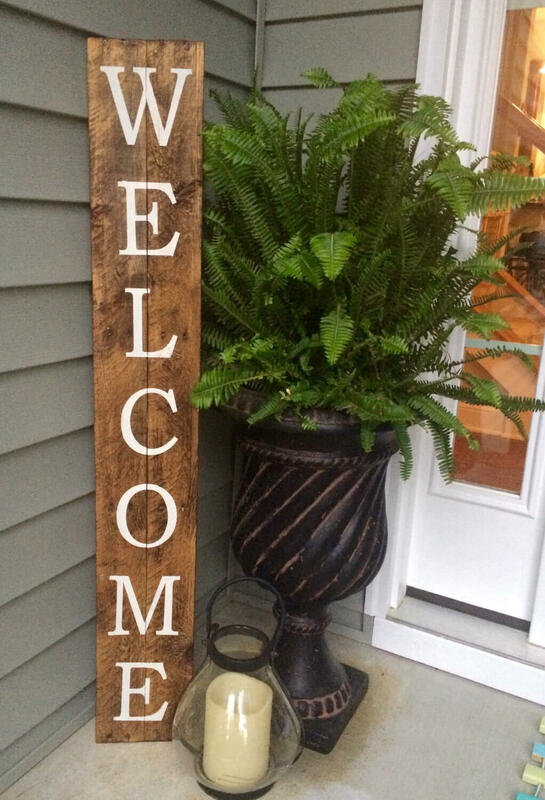 “Welcome” isn’t just for floor mats. 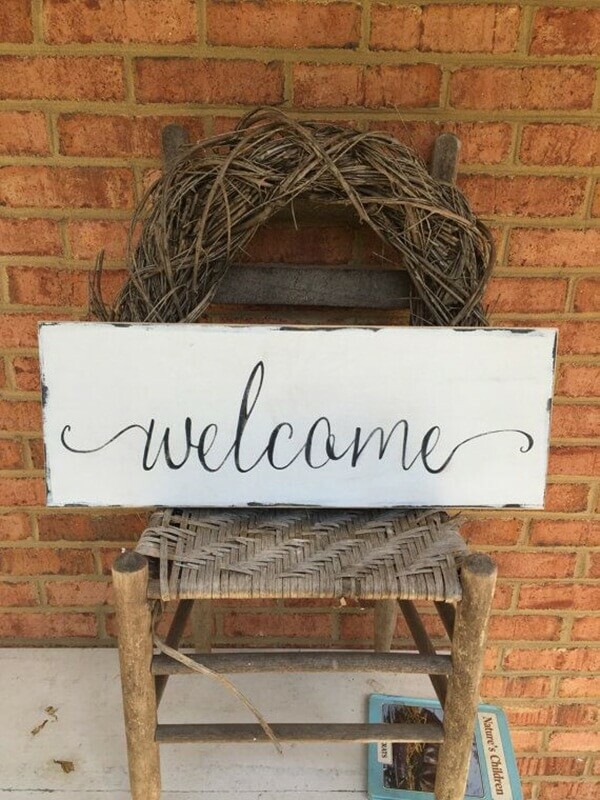 Framing a welcome sign with a grapevine wreath or a rattan chair, or hanging it proudly on a brick wall, are perfect ways to offer some country hospitality. 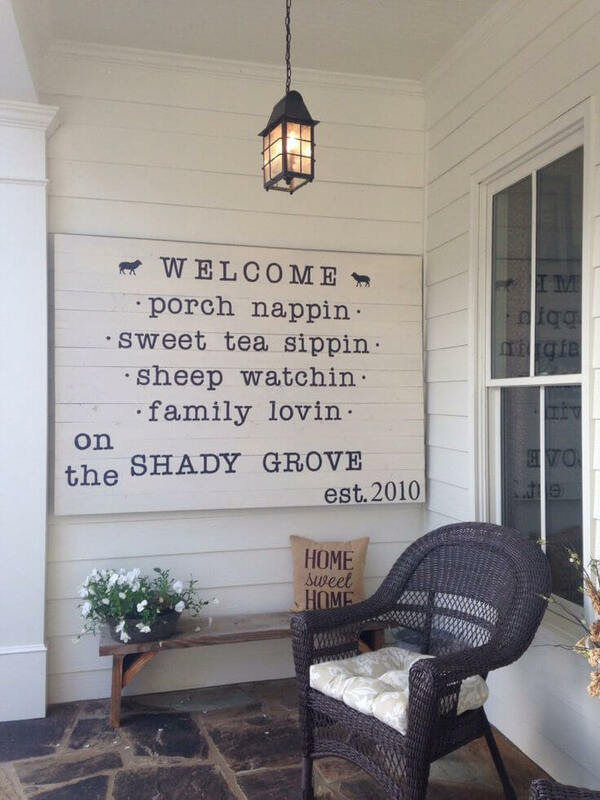 “No Shrubbery Digging Beyond This Point”: found signs can make wonderful conversation pieces, and rocking chairs are a perfect conversation place. 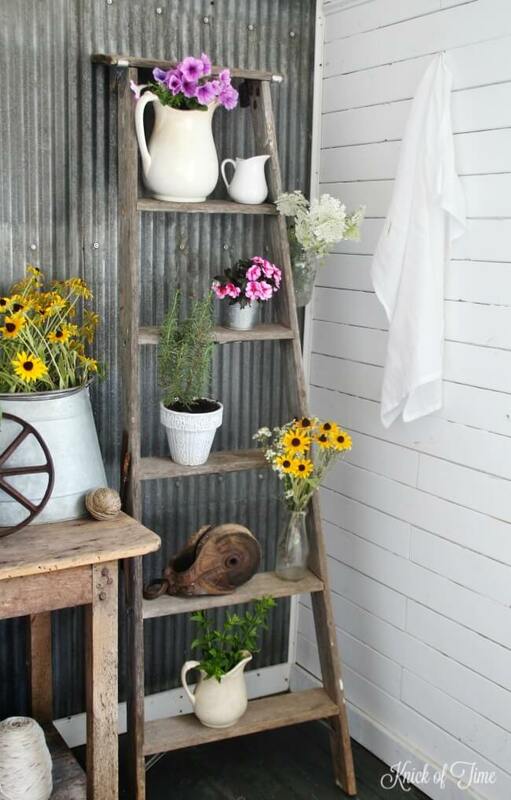 Antique lanterns, gingham and potted flowers add sweet rustic touches. 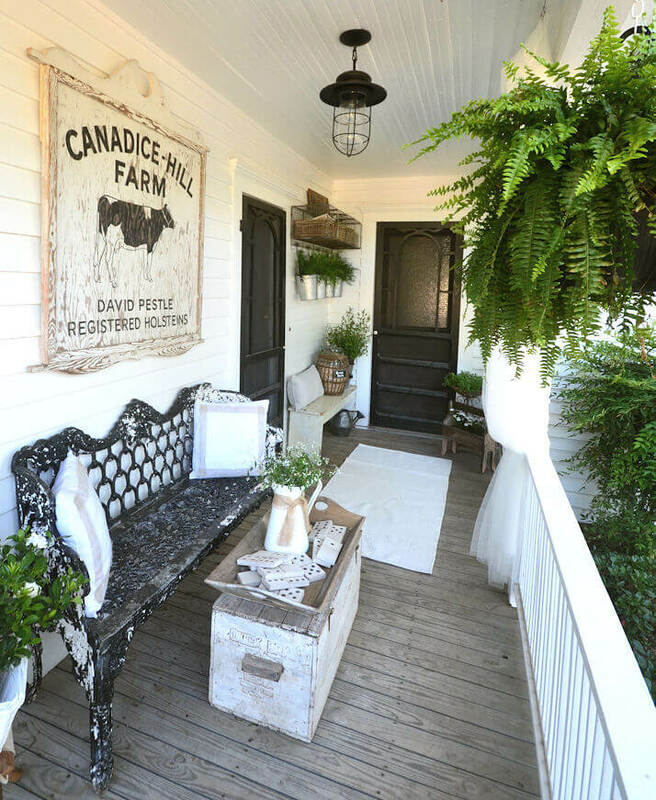 A cool palette of white wood and green ferns turns a farmhouse porch into a summer oasis. The wooden tray filled with oversize dominos invites guests to stop and make themselves at home, and enjoy a game or two. 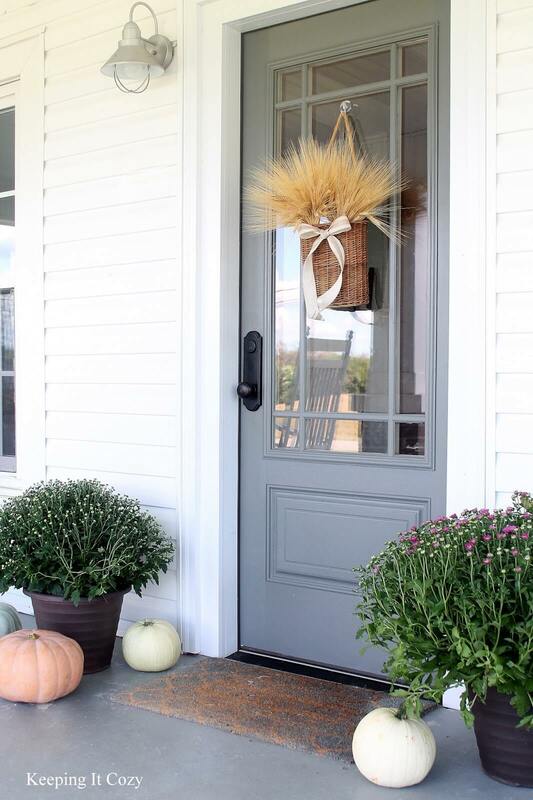 Hanging baskets aren’t just for flowers: autumn grasses and loose white ribbons lend a breezy feel to this door’s formal presentation between two twin pots of chrysanthemums. 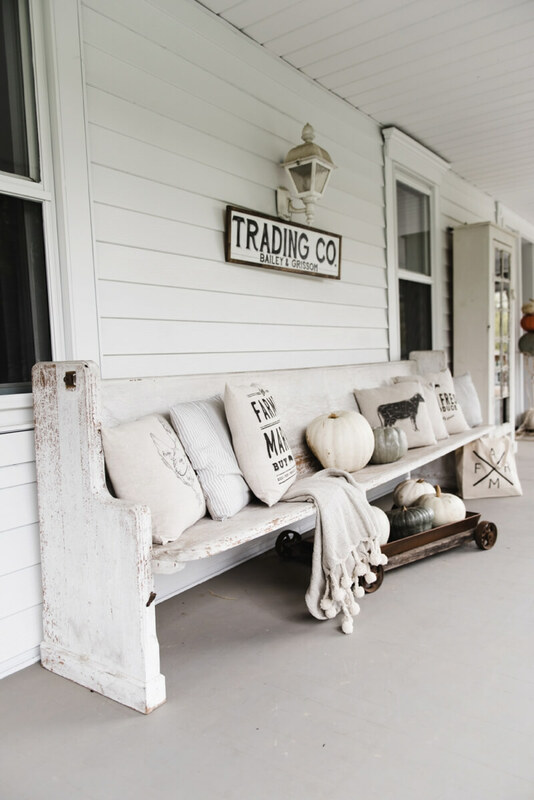 Harvest home takes on new meaning with stands of cornstalks, straw bales, oversize gourds, and berry wreaths. 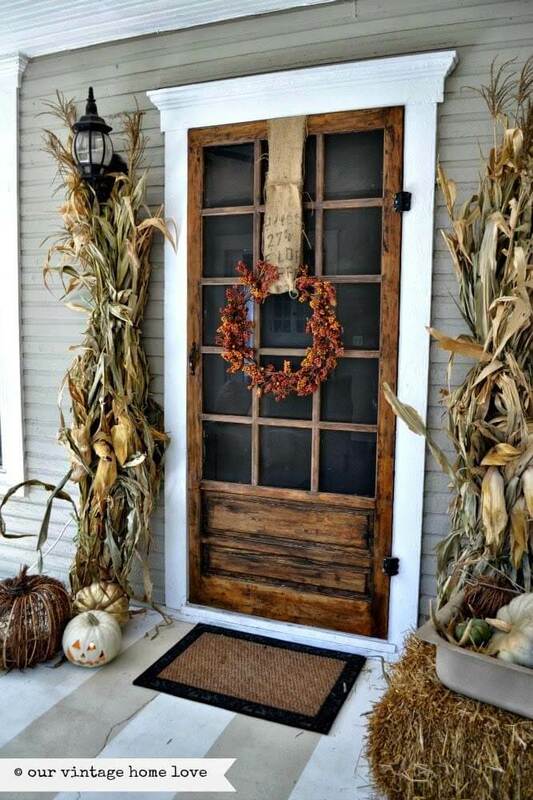 The autumn colors and textures together form an attractive and seasonal frame for the natural wood door. Cool grays and warm soft textures create an inviting corner to rest, crowned with a wreath that provides a spark of warm color. 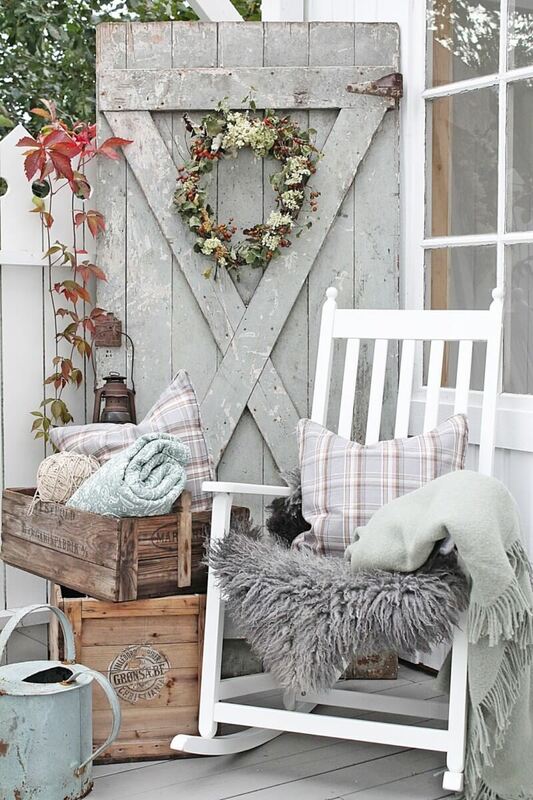 Piles of soft blankets make the wintry color feel cozy. Delicate, pale branches and translucent hanging spheres lend an airy feel to a bright entryway. Hints of toasty neutrals in the wreath and flowerpots warm up the space to make it even more welcoming. Rough and soft textures, like this straw bale paired with a blanket and knitted pillow case, create visual interest while offering an appealingly different place to rest. 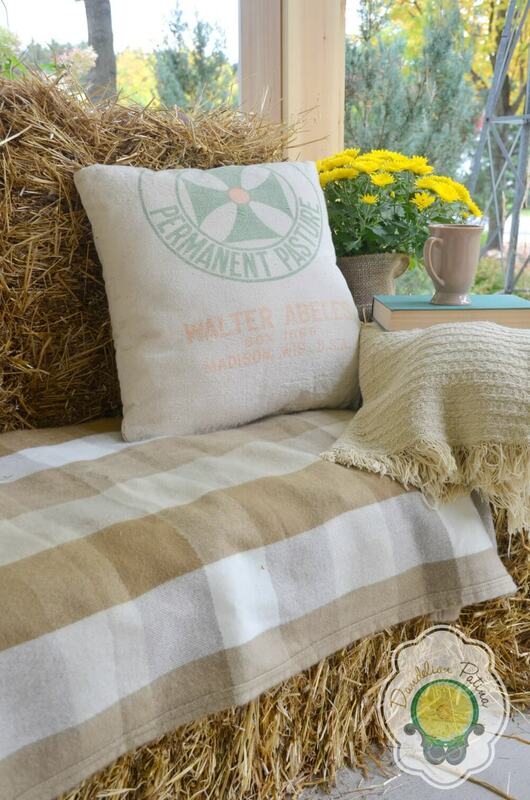 Cushion covers made from vintage feedbags or printed fabrics add a fun touch. Vintage pitchers, a lantern, and a seashell windchime hold their own against spreading greenery, while hanging from a shelf mounted on a garden fence. 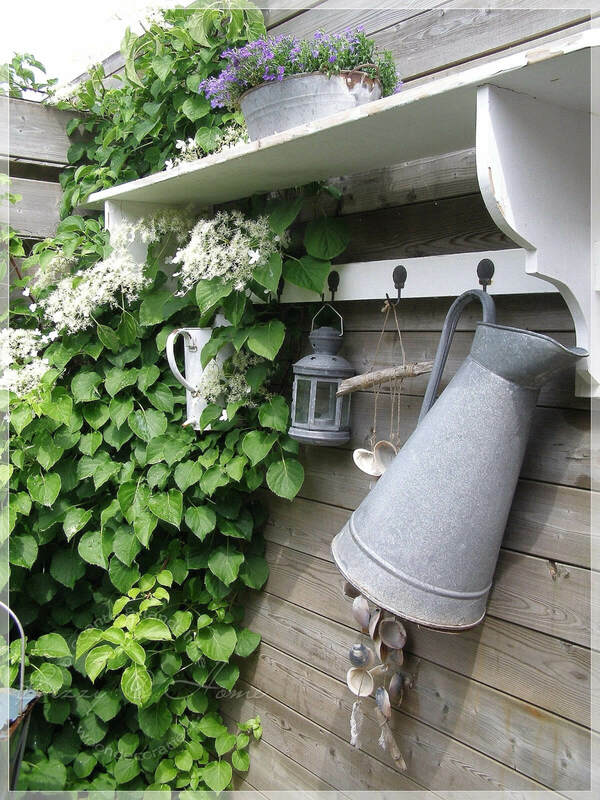 The shelf above provides handy storage for garden items. 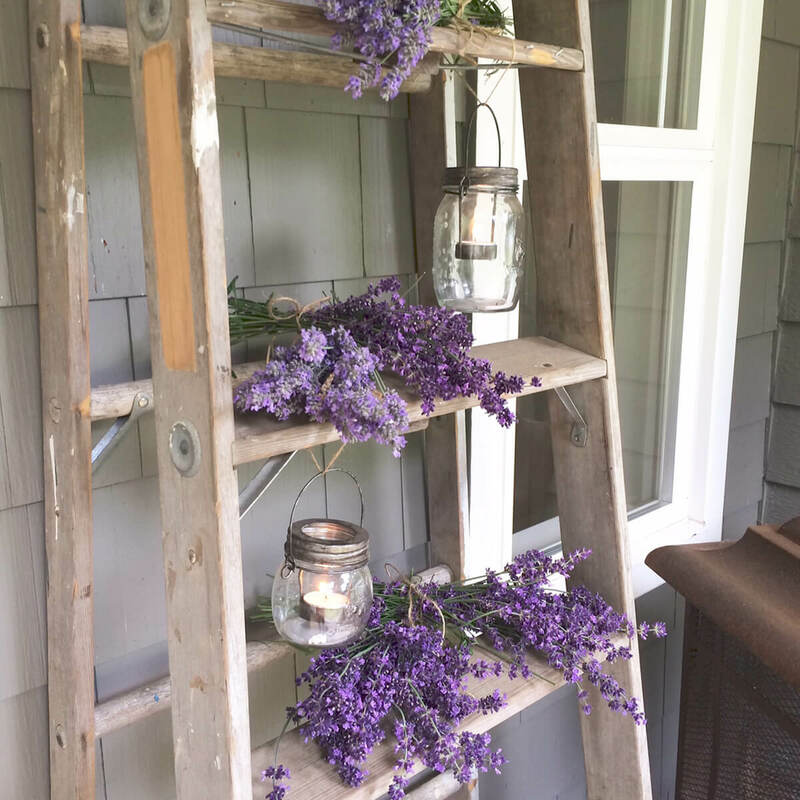 Lavender bouquets dress up a wooden ladder with fragrance and color. Mason jars provide a perfect nesting place for tealights in the evening, serving up warm lights with rustic flair. 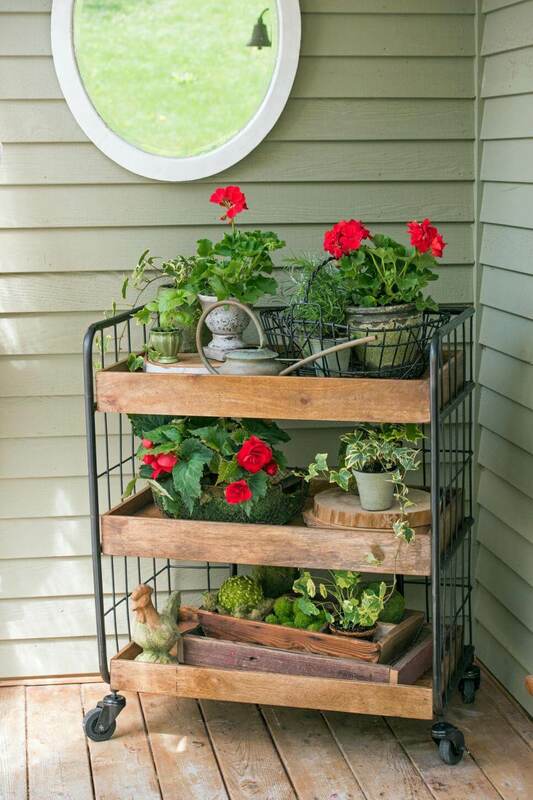 Even an old bed frame can find new life in the right setting. In this arrangement, it becomes a filigree backdrop for a hanging collection of iron pans and a scrubbed-clean wagon wheel. Everyday objects like pans, baskets, brooms and blankets frame a daybed sofa and lend its space a homey feel, while the potted cypress trees add just enough cheery color. 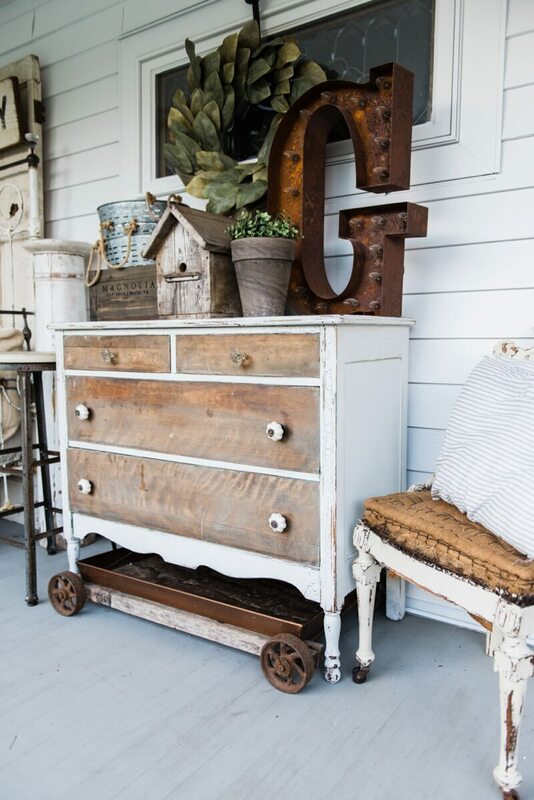 Vintage furniture and flea market finds, like old wooden cupboards, antique iceboxes, and vintage wardrobes, can be made beautiful and useful again with a coat of paint and a cheerful display on their top surfaces. 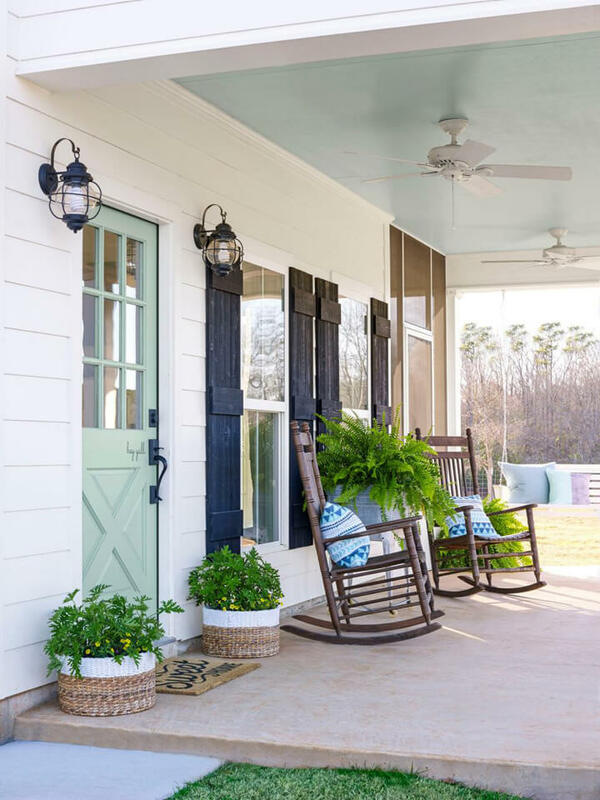 Painted shutters and companion rocking chairs serve up a generous helping of farmhouse hospitality. 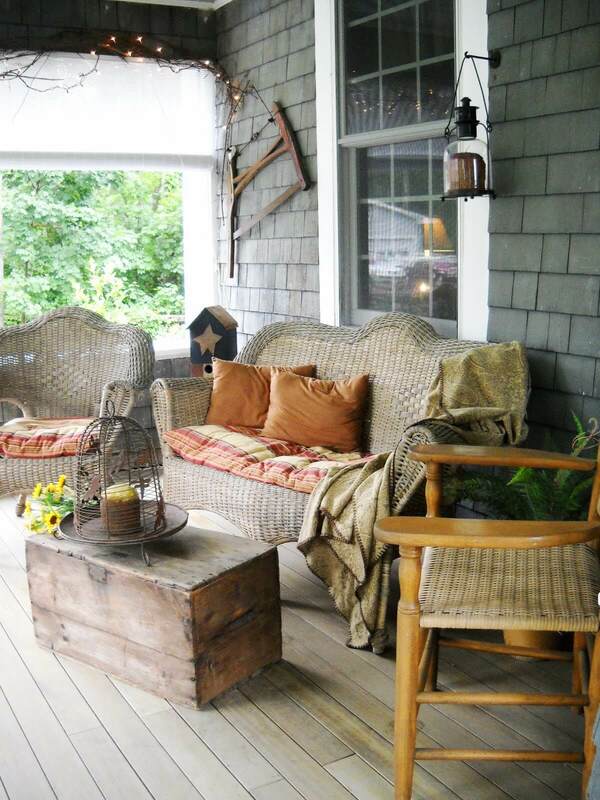 The clean spare space on this front porch lends a simple, friendly, and natural elegance to its rural home. Conversation corners and cozy seating make the most of sheltered outdoor space, and invite people to gather together. Here, a vintage wooden box serves as coffee table, and soft blankets are ready to warm up a chilly evening. 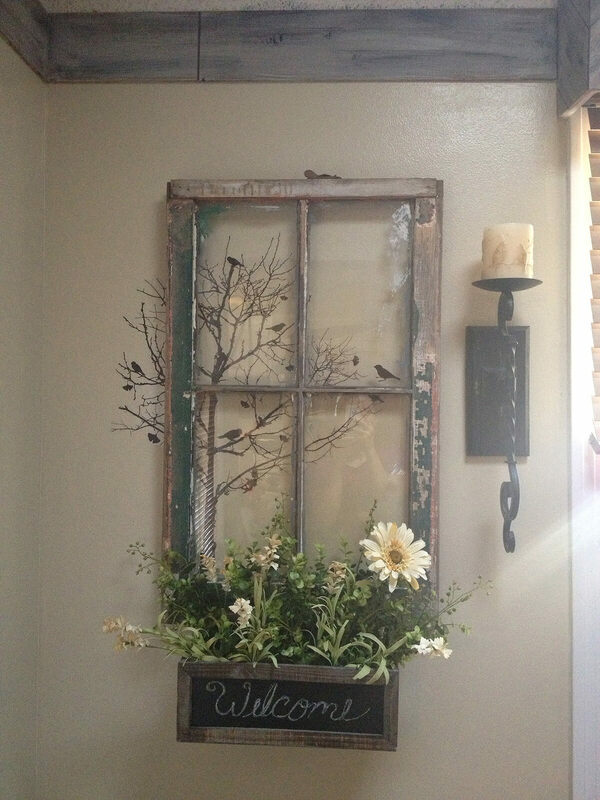 Old wooden windows find new life as rustic picture frames. 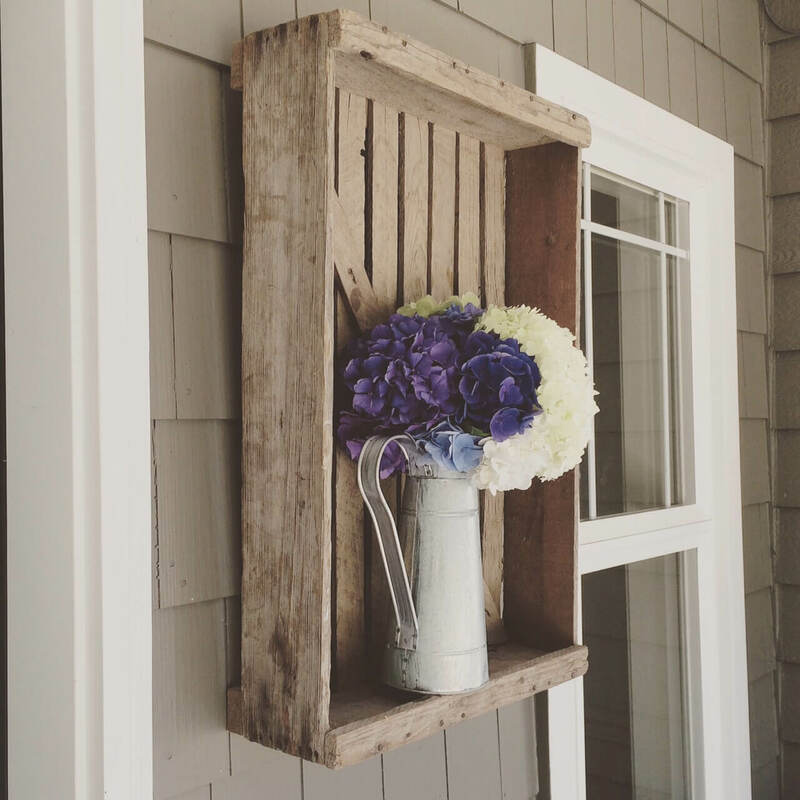 This one enhances wall art while offering a window box stuffed with wildflowers. The remaining distressed paint on the frame gives it a scruffy charm. Occasional tables are endlessly useful, and can be crafted from almost anything. Buckets, churns, cages, spools, logs: imagination is the only limit. The soft gray patina of this metal can table sets off the high gloss of its companion chair. 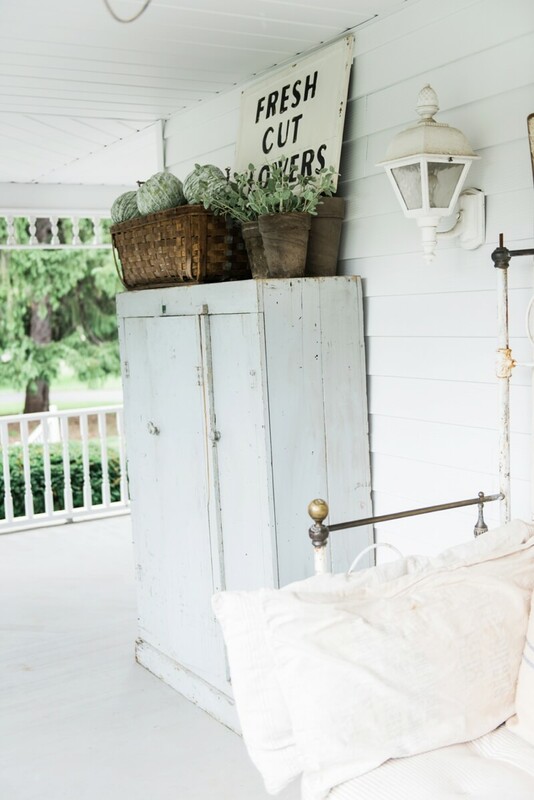 Salvaged furniture offers storage and display space, and creates a unique focal point for the porch. This restored dresser’s updated look in white paint and natural wood provides a pretty hiding place for candles, garden tools, bird seed or towels. 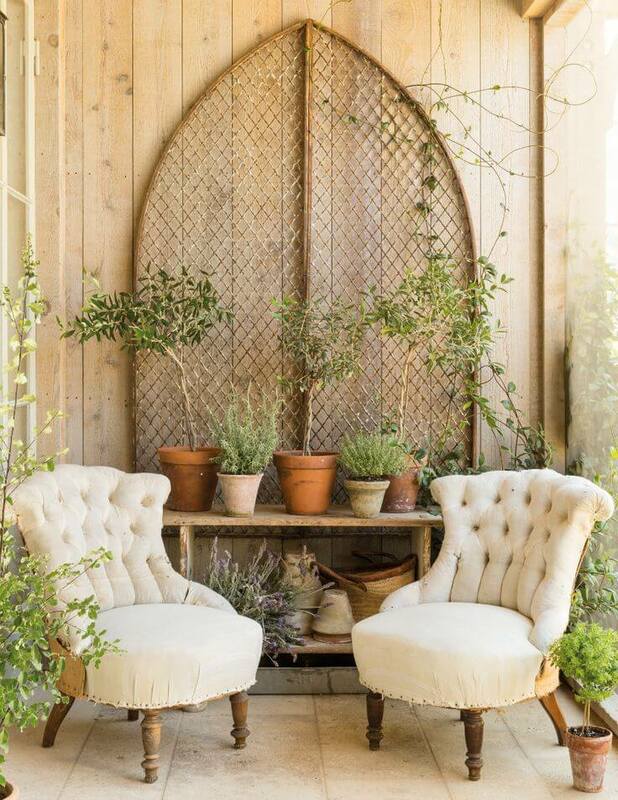 A rugged wooden potting bench together with its gothic arch backdrop create an enchanted garden setting for a pair of elegant tufted chairs, proving that rustic doesn’t always mean rough. 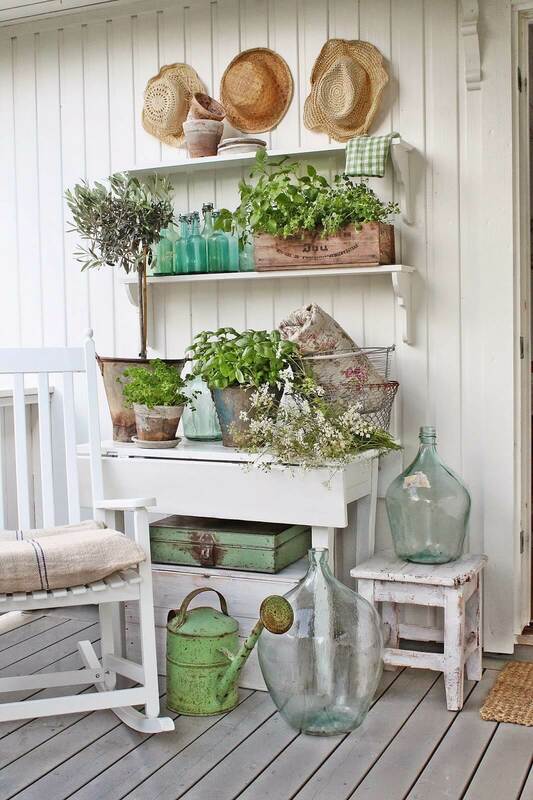 A pair of shelves over a matching drop-leaf table mimics a country dresser, displaying an abundance of pots and bottles for the resident gardener. The trio of hats, and balloon-shaped glass jugs, add to the collection of treasures. 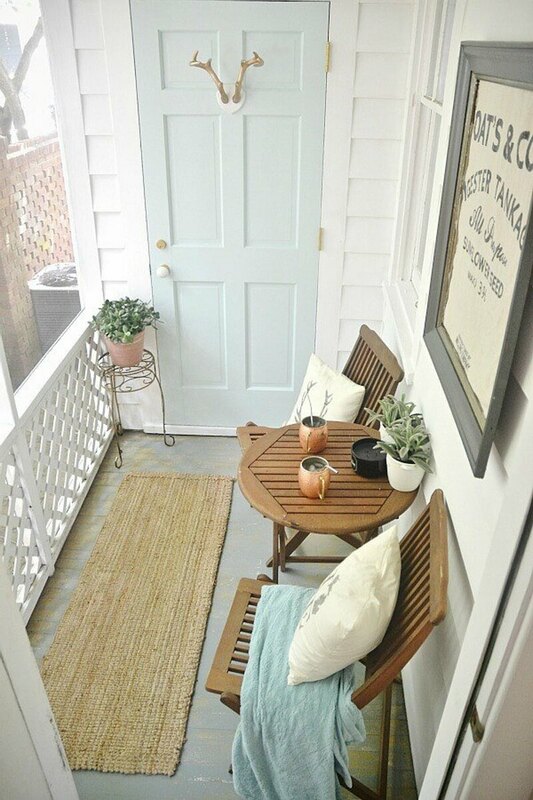 Even tiny porches can offer refuge when given clean bright colors and furniture scaled to fit. Little flower pots, folding chairs, and décor that hugs the walls are all good choices in this comfortably sheltered space.